John 1:14 And the Word became flesh and lived among us…. National Gallery of Art, WashingtonClick image for more information. Duccio’s altarpiece, Maesta (Majesty) painted for the Cathedral of Siena in the early fourteenth century, was composed of a large panel of the Madonna and child surrounded by a host of saints and angels. In its original form, this main panel was part of an assemblage that included many smaller paintings. Above the central painting were eight crowning panels depicting scenes pertaining to Mary’s death. 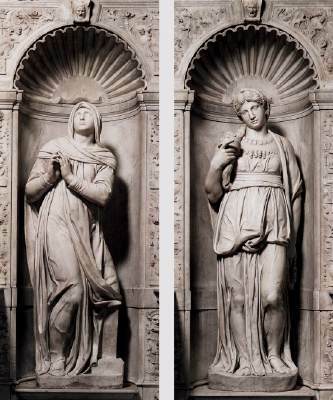 Below the central panel was a row of thirteen small paintings that made up a predella (Italian: kneeling stool); this served as a base or plinth. The Maesta was the first known altarpiece with a predella and this addition became a form used by subsequent artists. On the reverse side of the main panel there were originally forty-three smaller paintings representing events in Christ’s life. Adoration of the Magi: The Prophet Solomon (shown above). The panel to the immediate right of the Adoration of the Magi is the lone figure of Solomon, standing with a scroll on which is written a passage from the Book of Psalms; “The kings of Tarshish and the islands shall bring presents: the kings of the Arabs and of Sheba shall offer gifts” (Psalm 72:10). The figures of the prophets are small but, as seen in “Solomon,” they stand solemnly and with dignity. It is believed the statues on the facade of the Cathedral of Siena were used as models for each of the prophets. During the eight hundred years since the Maesta was painted, both time and human actions have taken a toll. In 1711, it was decided to take apart the altarpiece and divide the sections between the two altars of the cathedral. During this process, severe damage was caused. After it was taken apart, several sections were taken to museums and others were misplaced and are missing. A major restoration was done from 1953-1958 at which time it was discovered that part of the damage to Mary and Jesus was caused by nails being driven into their faces in order to hang rosaries. Until the nineteenth century, Italy was made up of independent city states and often there were rivalries among them. Neighbors such as Siena and Florence competed constantly with each other; they fought wars, had disputes over territory, and were rivals even in the arts. During the late thirteenth to the early fourteenth century, Florence was developing rapidly in the arts as Giotto and Cimabue worked there. During this same period, Duccio di Buoninsegna, better known as simply Duccio, was the principal painter in Siena. It was through his work and influence that Siena became Florence’s major rival in culture and art. The art of Siena during Duccio’s youth was influenced strongly by Byzantine iconography. Duccio, himself, was trained in the Byzantine style but as time progressed, he brought more life to figures than is found in the icons of Eastern Churches. Duccio’s most renowned work is a large altarpiece known as the Maesta (Majesty), designed for the Cathedral of Siena. In the early eighteenth century this altarpiece was dismantled and the parts separated but in its original form it was an assemblage of panels. The very large front panel of the Maesta is a single scene showing a Madonna and Child in large scale surrounded by smaller sized saints and angels. On the back side are a large number of individual paintings depicting scenes from the New Testament. Among them is, Christ’s Appearance to the Apostles. In Christ’s Appearance to the Apostles we see Jesus as he stands before the eleven remaining disciples after his resurrection. He is pictured as though he has just stepped before them and is speaking with his arms outstretched. The disciples, in turn, are all facing Jesus with a hand raised in a gesture that suggests they are startled and in awe. On the table are broiled fish; a piece of which was given to Jesus when he asked if they had anything to eat. Duccio’s composition is arranged simply but his attempt to create an illusion of space is awkward. Its shallow pictorial depth, the use of gold leaf, and Jesus’ robe are all manifestations of Byzantine art but the individualized faces and fullness of the robes of the disciples are departures from it as Duccio depicted Jesus and the apostles as real people; not as beings existing as though in another realm. By observing the appearance of things as we see them, Renaissance artists learned to create an illusion of space by devices such as linear and atmospheric perspective, size differences, color and value changes, and in the location of figures or objects in a picture plane. In Duccio’s painting, all parallel lines of the architecture and table would not meet at a point if they were extended as they would in linear perspective. The disciples with halos on the far side of the table are seen from waist up and we can’t be sure if they are standing or sitting on a bench; the disparity in size tends to negate space rather than to create an illusion of it. The perspective of the table also is awkward and the plates seem to be defying gravity. Yet, despite the inaccuracies of perspective, Duccio achieves a strong sense of unity through the repetition of shapes and colors. Above all, the emotional content of the subject is ever-present and overrides any technical distractions.